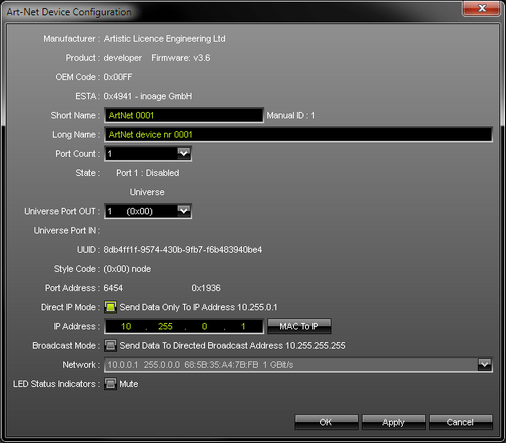 Art-Net is a communication protocol that allows to distribute DMX512 data over Ethernet network [DMX over Ethernet]. Art-Net has been invented by Artistic Licence and has now been published into the public domain. Often, so-called Art-Net nodes then act as Ethernet to DMX512 converters and hardware interfaces. Especially, long distances can be covered using Ethernet cabling. ▪ MADRIX supports all devices that are fully compatible with Art-Net. - You can use these nodes either as output or input devices. It is highly recommended to only use Gigabit Ethernet network components [such as network card, switches, network cabling, etc]. 2] Activate Art-Net in MADRIX. 3A] Add your Art-Net devices automatically. 3B] Add your Art-Net devices manually. 4] Edit the settings of your devices. 6] Assign the correct DMX universes. 7] Set up the Frame Time. 8] Choose to send optimized frames or full frames. ▪ Repeat steps 4] to 8] for each of your devices. ▪ The IP addresses of your computer and your Art-Net devices need to be different. ▪ Please remember to restart MADRIX, if you have changed the network settings in Windows while MADRIX was running. 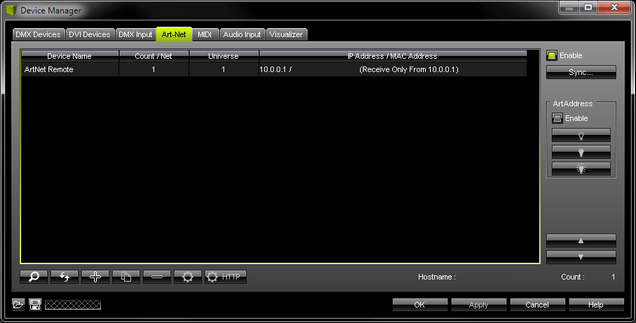 MADRIX can automatically add devices using the ArtPoll Reply functionality if supported by the Art-Net device. Some interfaces might not support ArtPoll Reply in order to add them automatically. Then, you need to add your devices manually. ▪ Number Of New Devices - Enter the number of devices you wish to add. ▪ Port Count Per Device - Enter the number of ports each newly created device should have. Per device a maximum number of 4 ports is available. - In order to create an 8-port node, set up 2 devices with 4 ports each. In most cases the same IP address should be entered then for both devices. ▪ Enable Direct IP Mode - Activates Direct IP Mode for all newly created devices. This setting can be changed later again. Learn more below. ▪ Send Full Frames - Activate this option if devices should always send a single data frame including a full number of 512 channels. If this option is disabled, MADRIX will automatically send optimized frames that reduce network traffic. Learn more below. ▪ A new window will open [Art-Net Device Configuration]. Set up specific settings for your device. ▪ Short Name - Represents a short description of your device. ▪ Long Name - Represents a long description of your device. ▪ Port Count - Represents the number of ports for this particular device. ▪ State - Displays if the ports have been activated under Preferences > Device Manager... > DMX Devices. Learn more below. ▪ Universe Port OUT - Defines the general allocation of DMX universe and device port for output. E.g., the eighth DMX universe is sent to port 8. 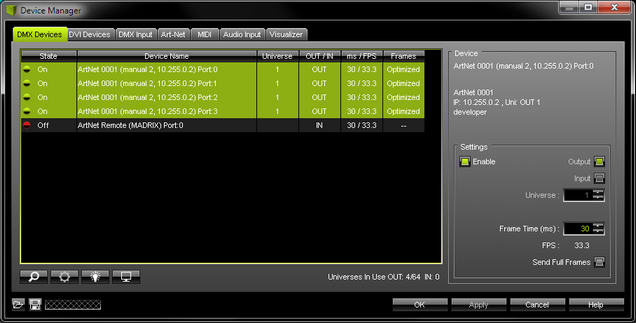 ▪ Universe Port IN - Defines the general allocation of DMX universe and device port for input. ▪ Direct IP Mode - Activates Direct IP Mode. Learn more below. ▪ IP Address - Defines the IP address of the Art-Net device when data is sent via Direct IP Mode. ▪ Broadcast Mode - Activates Broadcast Mode. Learn more below. ▪ Network - Defines the network card that is used for Broadcast Mode. Learn more below. Each of your Art-Net devices need to be activated. It is very important to set up the correct settings of your devices! - Advantage: The same data [e.g., DMX universe 1 and 2] can be made available at different points of your setup. - Make sure to enter the correct IP Address of your device that should receive the Art-Net data. - Make sure to select the correct Network card of your computer that should send the Art-Net data. ▪ This Sync Mode is not conform to Art-Net. To work properly it needs to be implemented by the manufacturer. Please check the manual of your Art-Net node if this option is available to you. ▪ Even if your Art-Net hardware does not support Pre Sync or Post Sync mode, it might be advisable to activate it in MADRIX. In this way, data packages will be sent one after another and will not get mixed up. The data will be sent more precisely. MAC To IP - Allows you to includes a tool to convert MAC addresses to IP addresses, and vice versa. ▪ OEM Code - Choose the manufacturer of the device. ▪ A] MAC Address - Enter the MAC address of the device and the tool automatically converts it into the correct IP address. ▪ B] IP Address - Enter the IP address of the device and the tool automatically converts it into the correct MAC address. If your Art-Net device is equipped with a subswitch, MADRIX is able to recognize this feature. ▪ This feature is for your information only. ▪ Check if your Art-Net device is equipped with a subswitch or not. ▪ The window will include several informative elements. In this way, you will be able to see the configuration of your interface within MADRIX. Refresh Device List - Communicates with connected devices to see if there have been any changes to update them in MADRIX accordingly. Duplicate Devices - Duplicates the selected devices to quickly add new similar devices. HTTP Configuration - Allows you to configure your Art-Net device remotely with the help of a web browser if this feature is supported by your device. If this feature is available, a new browser window will be opened using the specified IP address. This offers you access to the configuration of your Art-Net device. If this is not possible, a message box will be displayed in MADRIX. DMX Watcher - Opens the DMX Watcher to monitor your DMX output or input. ▪ Make sure to save your MADRIX Setup file after the configuration process. ▪ If you are using a network-based output protocol and if the Startup option Start MADRIX After Booting Windows is activated, it is highly recommended to also activate the Startup option Start With Timeout (s) with a value of 30. ▪ When activating Art-Net, MADRIX will create a so-called shared socket and not an exclusive socket. Therefore, other software on the computer has the chance access Art-Net using the same socket, when running MADRIX and another software at the time. ▪ It is not recommended to operate Art-Net and access to the World Wide Web/Internet in the same network! It is recommended to run it in a separate network without internet access. 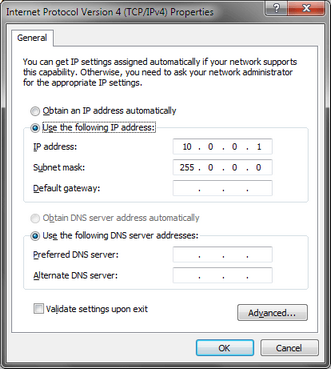 ▪ Double-check the settings of your network card [IP address, Subnet mask]. 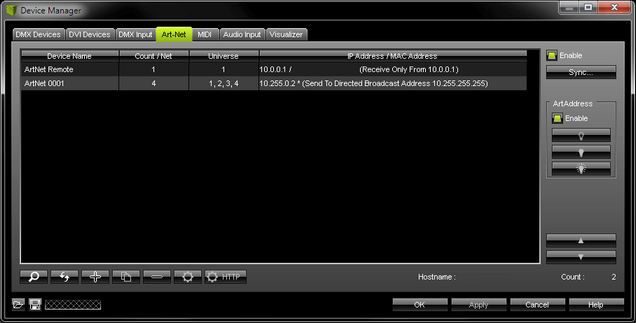 ▪ Double-check the settings of the Art-Net devices in MADRIX. ▪ Use only GIGABIT [1GBit/s or 1000 MBit/s] network components [such as, switches and network cards]. ▪ Use high-quality network components [cables, switches, cards, etc.]. ▪ Check all other IP addresses and cabling. Having the same IP address in the network causes problems. Make sure that the network is not forming a ring, were the start point is also the end point, and that data is not sent back to the source [the computer]. ▪ If output problems occur, decrease the output frame rate [FPS] in the Device Manager. ▪ Make sure that Art-Net is set up as an individual network and separate from the Internet.